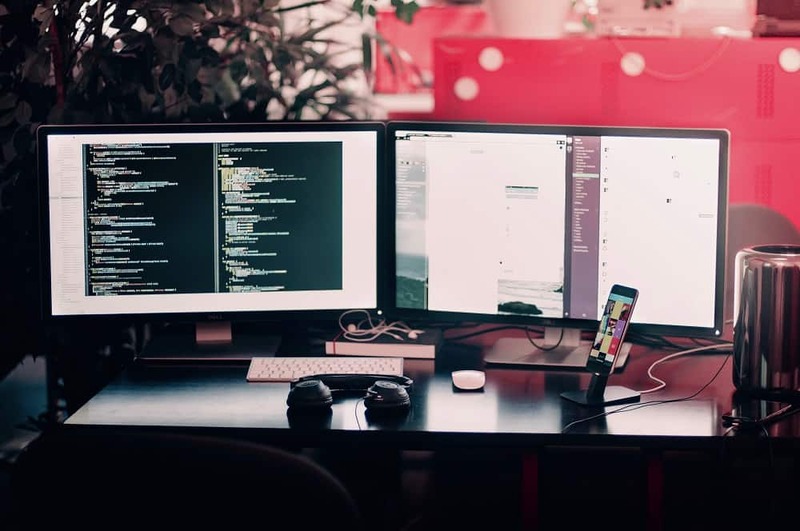 With all the new developments in information technology, the workplace as we know it has changed dramatically. In this digital age, a more mobile workforce – schooled in computers and smartphones – is moving away from the traditional office and setting up space at home to conduct business. And why not? 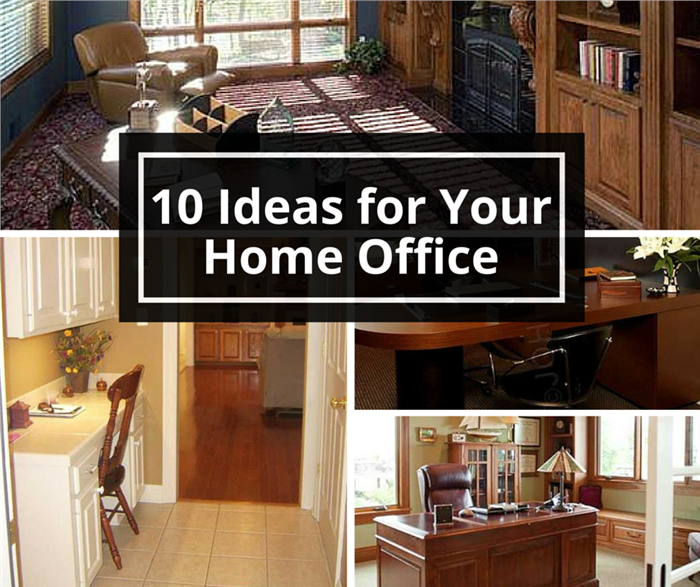 An office based at home is convenient and practical, and can be a comfortable and relaxing space. As the home office becomes one of the biggest design trends in 2016, architects and designers are finding room in floor plans for this practical space in both new homes and remodels. 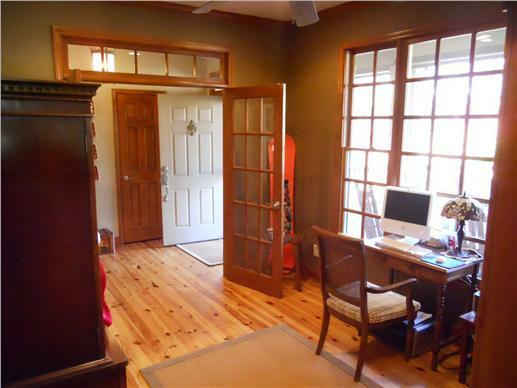 And if you are shopping for a new dream home, you can even narrow your search to those house plans with a home office. 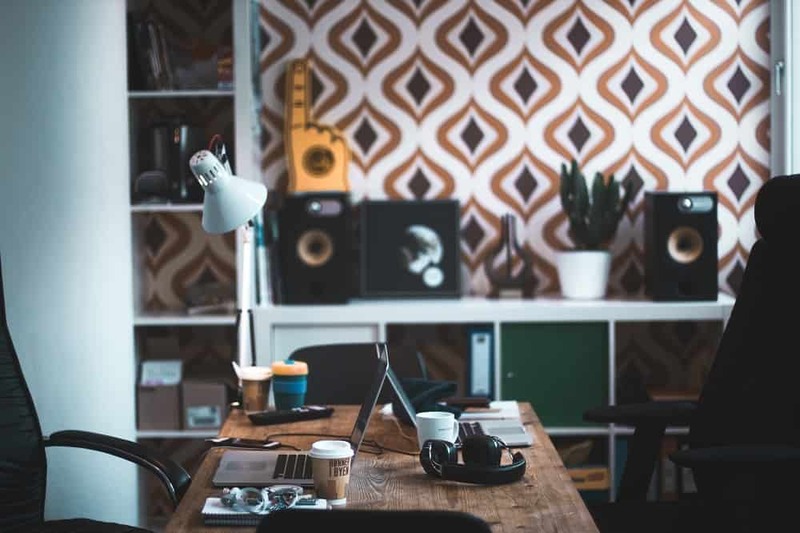 So as you ponder the pros and cons – and feasibility – of telecommuting, here are some ideas on how to make your new home office functional, organized, and at the same time, stylish and fun. It is an office, after all. 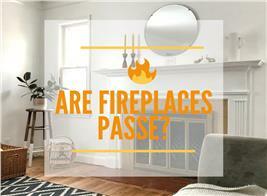 So choose a corner, nook, or a room in your floor plan where you can concentrate on the tasks at hand. 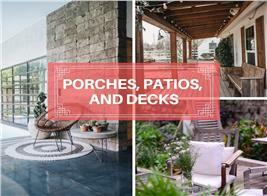 If you’re self-employed and sometimes entertain clients or other visitors, it is best to be in a spot that is separate from all the centers of activity in the home. In the open floor plan of a 2-story, 5-bedroom traditional Eurpoean-Style luxury home plan, this office is designed with sliding doors, whcih keep it private and separate from family activities when necessary. It is bright, roomy, and furnished in a classically traditional style (Plan # 161-1030). 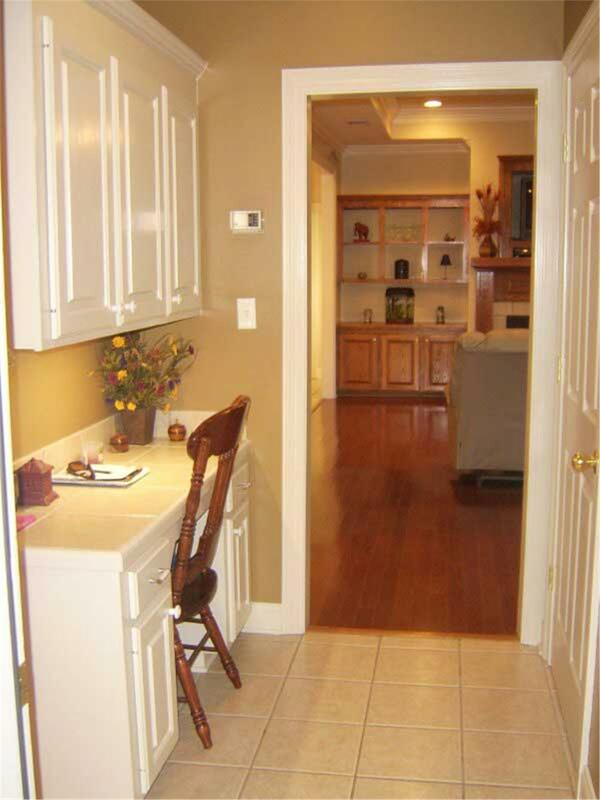 For those who use the space primarily to sort mail or open and pay bills, a dedicated corner or nook near the kitchen or pantry will do just fine. No home office in the house plan? Not a problem! 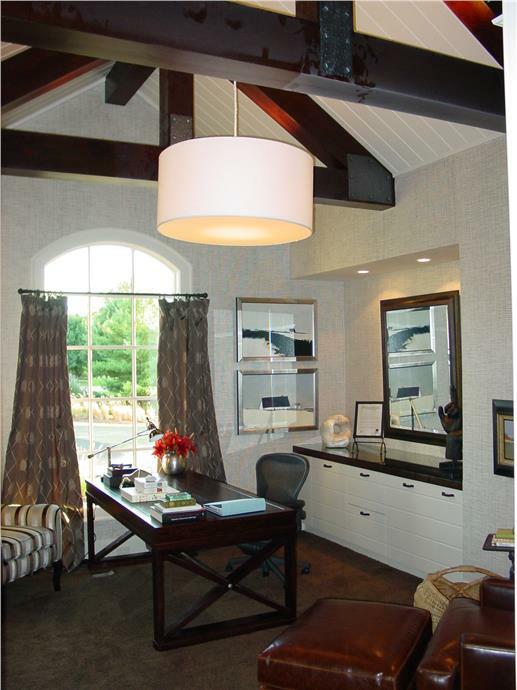 This informal “home office” (left) situated outside the Great Room of a 3-bedroom Ranch-style home plan features a simple but attractive built-in desk – ideal for reading, writing, and sorting mail (Plan # 141-1134). 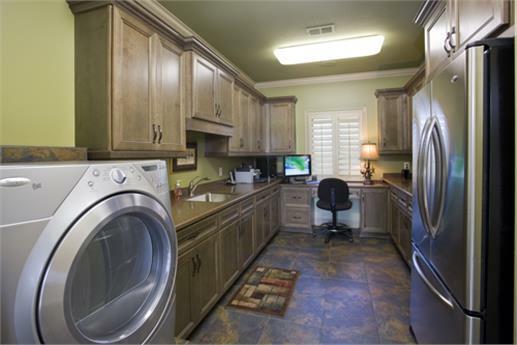 And here’s how one can be even more creative with available space – in this case (right), the laundry room of a 4-bedroom Country-style house plan. Build in a desk that faces a window and is directly below a light fixture; put in a lamp – and you’re in business (Plan # 153-1904). 2. Use a splash of color. While “50 shades of gray” may have been popular in the recent past, you can walk away from bland colors and go for something bold and bright – say, a yellow, burnt orange, something blue or green – to inspire you. 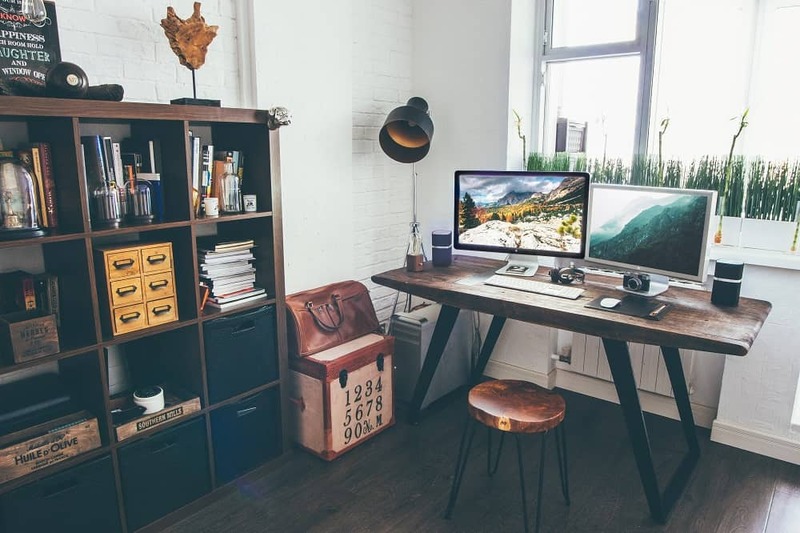 If you’re renovating and a small corner is all the space you have for your office in your floor plan, go with your home’s color scheme and get accessories that complement those tones. 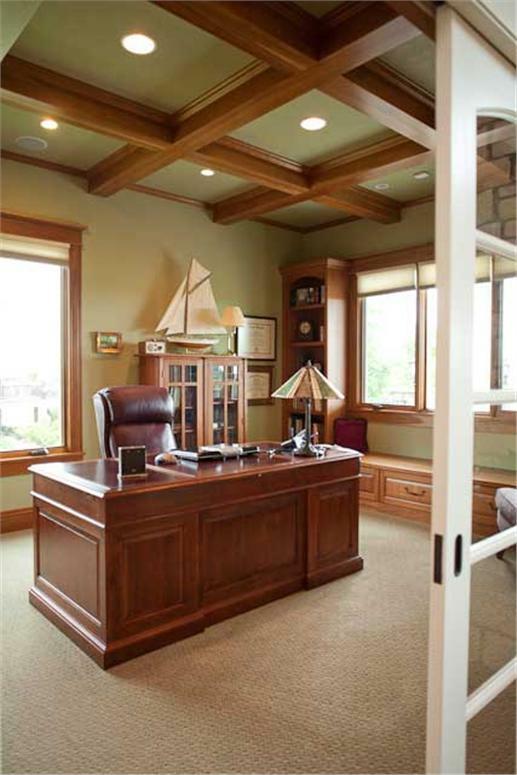 For a home office in a more traditional home, think about dark and light browns, soft greens, and other earth tones. You can work, read, and see better with good lighting in the office. Windows – and plenty of them – are ideal and allow natural light into the space. If windows are not an option or there aren’t enough of them, be sure to have ample light fixtures – overhead or track lights – and lamps in the room. Natural light filters into this work space through the large multi-paned window of a 1-story, 2-bedroom Craftsman-style home plan (Plan # 163-1025). A lamp on the desk provides additional lighting. You can’t fix your eyes on the computer all day or stare at a blank wall. So select a room that gives you a view of the landscape, trees, the courtyard, garden, or even the driveway. Look up from whatever work you’re doing, and get a calming view of the courtyard from this home office of a 2-story Tudor-influenced house plan (Plan # 168-1104). 5. Be creative with your wall. 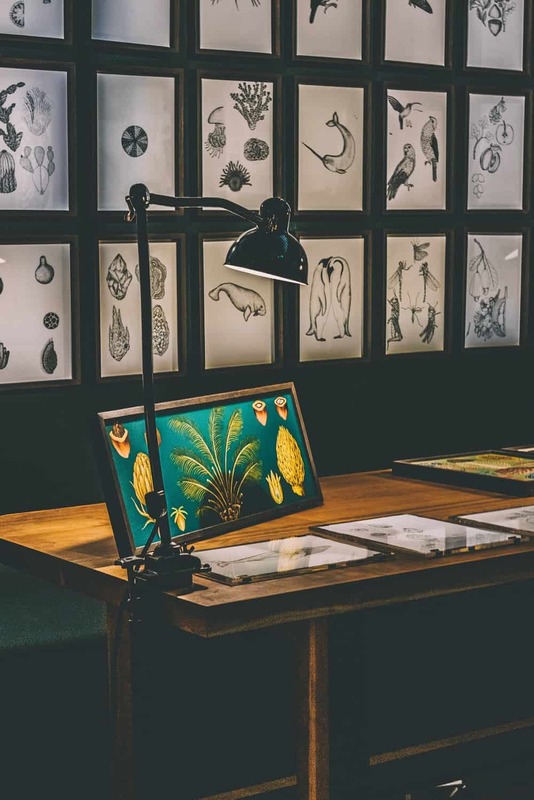 Put up prints, frames, calendars, bulletin boards, or wallpaper to enhance your home office. In fact, wallpaper is now very popular in home office designs. 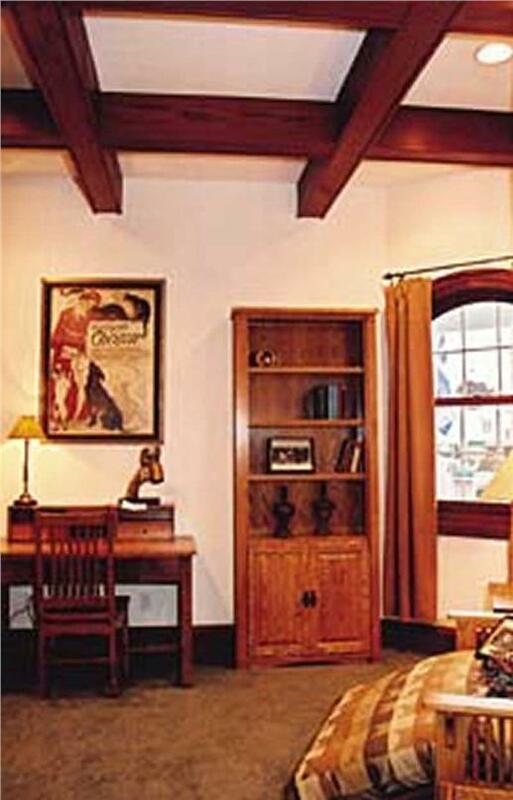 A framed art print and vintage bookcase with a cabinet are the wall accents of this home office (left) in a 2-story, 3-bedroom Victorian-style house plan (Plan # 126-1284). 6. Invest in comfortable furniture. Space and comfort dictate the kind of furniture for your home office. Think about your health as you choose a desk and chair. If you spend a lot of time sitting in front of your computer, invest in an ergonomic chair that gives you back support and allows you to move freely. 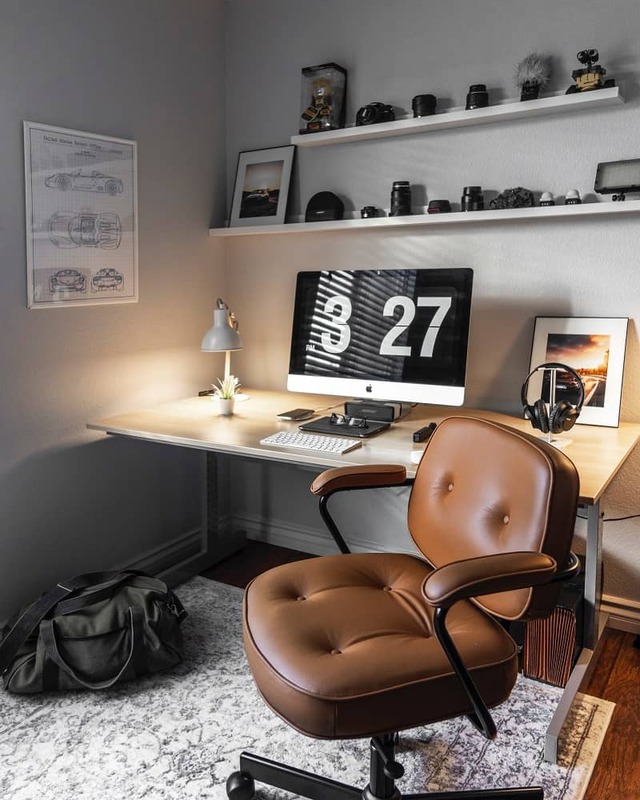 Your desk should fit your space and style and complement the chair. 7. Put your office in order. Whether you have a separate room in your floor plan or a corner in the home, keep it organized and clean – and the clutter to a minimum. Everyone can understand the stray notepad or pen, but not a chaotic work space. Use desk drawers, bins, shelves, or a bookcase to organize your papers and other documents. Everything is in its place for a clean, uncluttered look in this home office (left) of a 2-story modern Florida-style house plan (Plan # 107-1015). The office comes with a desk, drawers, and cabinets above the work space. 8. Make it a multi-purpose space. The great thing about having a home office as part of our home plan is that it can be used by family members for their own tasks. It can be a craft/hobby space, a homework station for kids, or even a casual project room for the family. 9. Create a fun place. Lively decor, furnishings, and accents not only give the room flair but also make it intriguing. 10. Make it reflect your personality and style. Add personal touches, knick-knacks, photos, or other decor that define your style and interests. 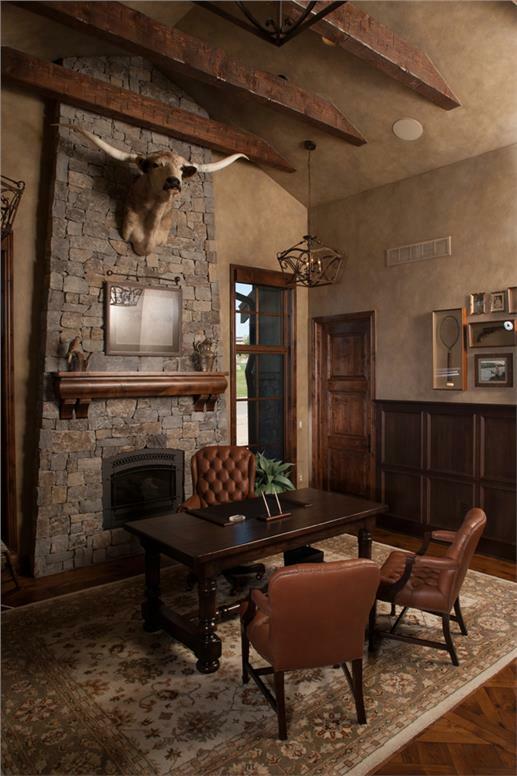 This office in a 5-bedroom Country-style home plan reflects the interests and hobbies of the owner: an animal head on top of the fireplace mantel; prints and framed photos above the cabinets on the right (Plan # 161-1053). With these design tips, you can change the face of your home office – and make it exciting, vibrant, and fun! Footnote: The lead image (upper) in this article is the office of a 5-bedroom Country-style home plan with European influences. 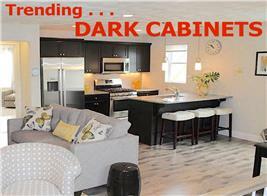 For more on the house plan, click here.